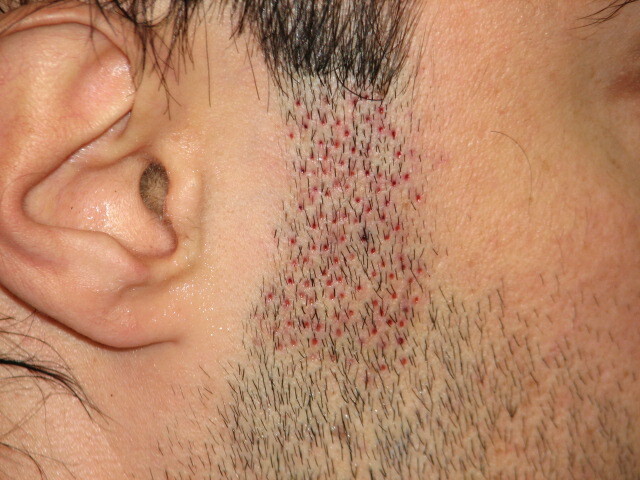 This patient had a test session to see how the beard hair extractions would heal. 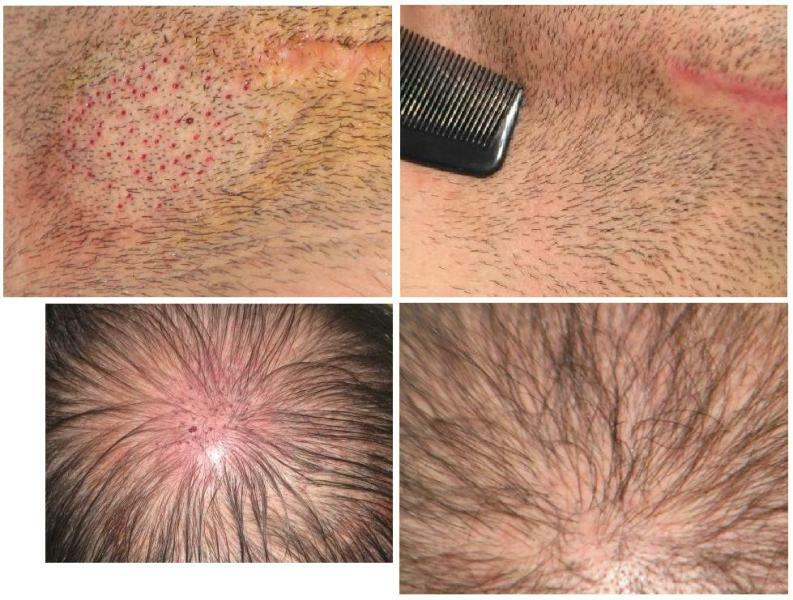 He also wanted to discover the growth rate and coverage he could expect from a larger session of beard hair transplant. From the before and after images here, it is evident that the extractions are not visible after healing. The growth rate was very high. 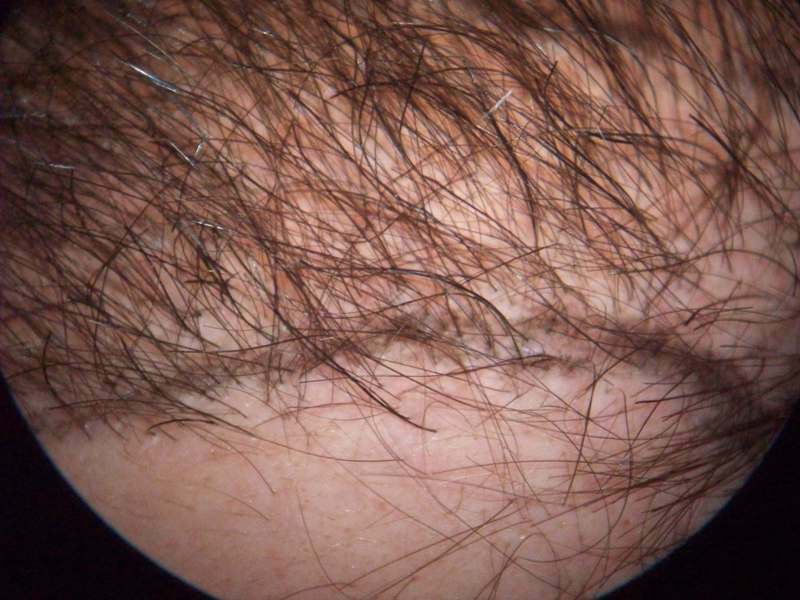 The beard hairs growing in the crown are visible upon close inspection as they are thicker and have a slight curl. With proper blending and strategic placement, beard hairs can look very natural on the scalp. Side by side comparison of the extraction area. After extractions and after healing. This is what beard hair grafts look like with magnification. 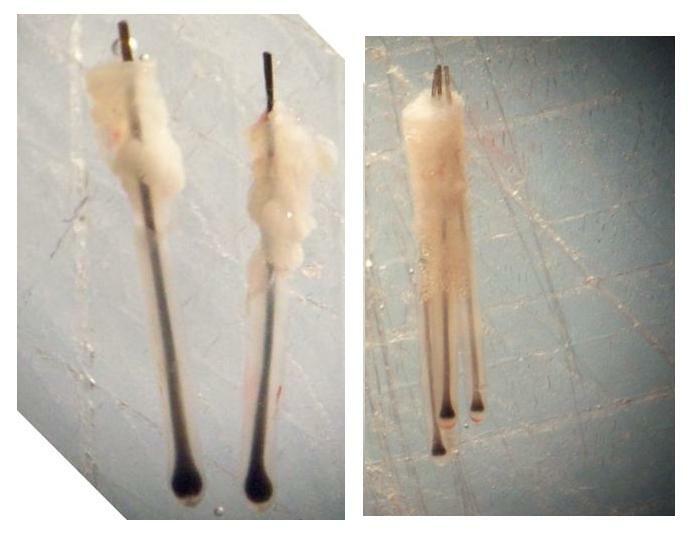 The grafts on the left are beard hair and the graft on the right is scalp hair. The differences in caliber can work for or against you - it depends on the skill and vision of the doctor. With proper blending and strategic placement, beard hair transplants can look very natural and give you more coverage. After the successful test session, the patient decided to go forward with another session. It has been less than one year, but the beard hairs can already be seen growing between scalp hairs. Note the thicker caliber that can be utilized for extra coverage. In areas of diffuse thinning, beard hairs can help to strengthen the area. To achieve a natural look, Dr. Mwamba blends the beard hair into the thinner scalp hair. Care must be taken when grafting beard hair into the hairline. The thick caliber can have an unnatural look if not blended correctly. As the results grow in, we will post updated photos. “Care must be taken when grafting beard hair into the hairline. The thick caliber can have an unnatural look if not blended correctly.” I really do not think it’s a good idea for reasons stated . » do not think it’s a good idea for reasons stated . Scalp hair is preferred for hairline work. In some cases scalp hair is unavailable, in which case beard hair must be strategicaly placed and blended to maintain a natural look. 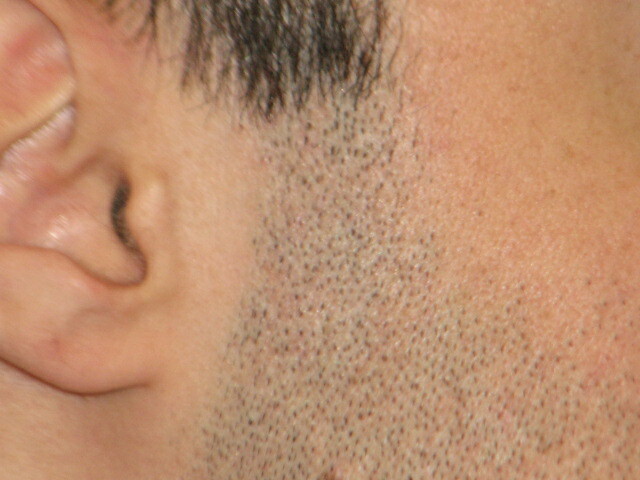 A frontal hairline of beard hair can be too thick and coarse to be natural. If there is sparse coverage just behind the frontal hairline, beard hair can work nicely to thicken it. » look very natural on the scalp. » hairs can help to strengthen the area. To achieve a natural look, Dr.
» Mwamba blends the beard hair into the thinner scalp hair. » caliber can have an unnatural look if not blended correctly. » As the results grow in, we will post updated photos. Excellent, thanks for posting these results. It would be nice if like Dr. Arvind does, you could post the exact number of grafts placed. Has this patient decided to do any more beard hair grafts since this initial one? I’d like to chart the result of ONE patient that has had a large number of beard hair grafts placed, to my knowledge, very few photographic, side by side comparison photographs showing beard hair at various stages of growth have been documented. I think they will always look okay in the crown area, or for scar repair, regardless of the patients hair type. We did 100 grafts for the test session.We didn’t do a study protocole because of patient’s antecedents (previous multiple surgeries and scarring).We knew body hairs will grow ;he was more concern about the marks that the punch will leave in his face. After the results ,he decided to treat last december the crown area with 300 grafts;then we pursue his surgery in february with aroun 600 grafts on top or middle scalp (I will give you the exact numbers when we will do the final report:I don’t have his chart on hands);and in March 2008 ,we completed the frontal zone with 1000 grafts. This patient received around 2000 grafts total.You will notice we grafted at low density because of the alteration of his recipient area and we will definetely give you his progress around september (6 months post-op) ,december (9 months post-op and finally in March next year). Characteristics of beard are quite promising but we really have to wait in our practice the one year point before to jump to conclusions.We got now a pretty good series (most of them under 6 months post-op) and we will come up with preliminary conclusions in few months. » » look very natural on the scalp. » » hairs can help to strengthen the area. To achieve a natural look, Dr.
» » Mwamba blends the beard hair into the thinner scalp hair. » » caliber can have an unnatural look if not blended correctly. » » As the results grow in, we will post updated photos. » Excellent, thanks for posting these results. It would be nice if like Dr.
» patient decided to do any more beard hair grafts since this initial one? » or for scar repair, regardless of the patients hair type. » that the punch will leave in his face. » completed the frontal zone with 1000 grafts. » ,december (9 months post-op and finally in March next year). » up with preliminary conclusions in few months. Thanks for your input Dr. Mwamba, looking forward to these results.